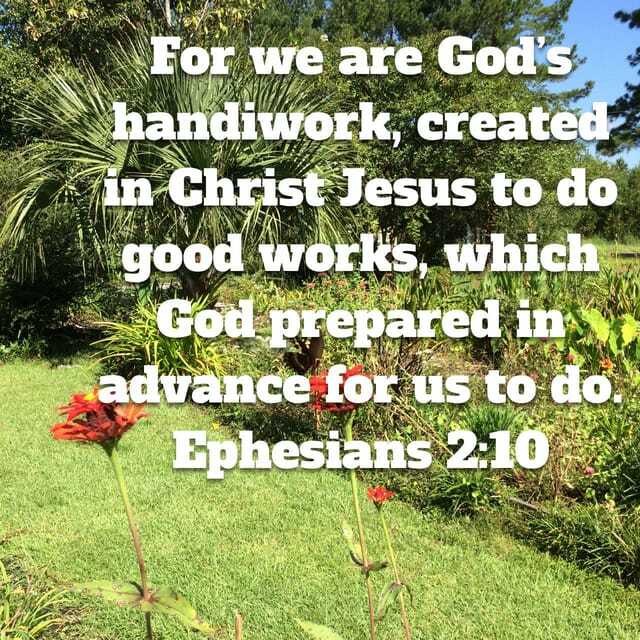 We are His Handiwork…to work? | You Are Not the Only One Ministries and Consulting Services Inc.
We are His Handiwork…to work? 04 Sep 2017 Comments Off on We are His Handiwork…to work? There are times when we think that we should just show up to church find our seats in the pews and sit down to hear “The Word” that God has prepared for us. This Scripture implies that we God’s handiwork. He works through human beings. Have you ever been on a job where you were written up or corrected for shoddy workmanship? Well, God said he created us to do good works. 2 Thessalonians 2:17 Comfort your hearts, and establish you in every good word and work. All of this takes effort on our parts. Not that we can gander salvation for ourselves because we cannot. But when we work as unto the Lord we must give HIm our best efforts. 10. workmanship—literally, “a thing of His making”; “handiwork.” Here the spiritual creation, not the physical, is referred to (Eph 2:8, 9). created—having been created (Eph 4:24; Ps 102:18; Isa 43:21; 2 Co 5:5, 17). unto good works—”for good works.” “Good works” cannot be performed until we are new “created unto” them. Paul never calls the works of the law “good works.” We are not saved by but created unto, good works. before ordained—Greek, “before made ready” (compare Joh 5:36). God marks out for each in His purposes beforehand, the particular good works, and the time and way which tie sees best. God both makes ready by His providence the opportunities for the works and makes us ready for their performance (Joh 15:16; 2 Ti 2:21). that we should walk in them—not “be saved” by them. Works do not justify, but the justified man works (Ga 5:22-25). [So why bother? We are in a relationship with a Holy God. When He tells us to work for the betterment of His kingdom – we give Him our best. Not what is left over after we have pursued the fulfillment of our fleshly desires. Our lives are knitted into His will not out. Matthew Henry speaks to the grace by which we are saved. Not as an excuse to do as we please, but to living and work as unto the Lord. 2:1-10 Sin is the death of the soul. A man dead in trespasses and sins has no desire for spiritual pleasures. When we look upon a corpse, it gives an awful feeling. A never-dying spirit is now fled, and has left nothing but the ruins of a man. But if we viewed things aright, we should be far more affected by the thought of a dead soul, a lost, fallen spirit. A state of sin is a state of conformity to this world. Wicked men are slaves to Satan. Satan is the author of that proud, carnal disposition which there is in ungodly men; he rules in the hearts of men. [The proud does what he wants, how he wants, and when he wants to. ]From Scripture it is clear, that whether men have been most prone to sensual or to spiritual wickedness, all men, being naturally children of disobedience, are also by nature children of wrath. What reason have sinners, then, to seek earnestly for that grace which will make them, of children of wrath, children of God and heirs of glory? God’s eternal love or good-will toward his creatures, is the fountain whence all his mercies flow to us; and that love of God is great love, and that mercy is rich mercy. And every converted sinner is a saved sinner; delivered from sin and wrath. The grace that saves is the free, undeserved goodness and favour of God; and he saves, not by the works of the law, but through faith in Christ Jesus. Grace in the soul is a new life in the soul. A regenerated sinner becomes a living soul; he lives a life of holiness, being born of God: he lives, being delivered from the guilt of sin, by pardoning and justifying grace. Sinners roll themselves in the dust; sanctified souls sit in heavenly places, are raised above this world, by Christ’s grace. The goodness of God in converting and saving sinners heretofore, encourages others in after-time, to hope in his grace and mercy. Our faith, our conversion, and our eternal salvation, are not of works, lest any man should boast. These things are not brought to pass by any thing done by us, therefore all boasting is shut out. [That is why we work as unto the Lord. Our fleshly desires have no role in Kingdom work.] All is the free gift of God, and the effect of being quickened by his power. It was his purpose, to which he prepared us, by blessing us with the knowledge of his will, and his Holy Spirit producing such a change in us, that we should glorify God by our good conversation, and perseverance in holiness. None can from Scripture abuse this doctrine, or accuse it of any tendency to evil. All who do so, are without excuse. Our Good, Good Father created us to do good works in His name! Previous Sharing The Story with all Languages – one nation at a time! Next Call upon the Lord and be saved!